Information: Hugh Ansfrid Thurston, teacher and author of books about Scottish folk dance. Hugh was also editor of The Folk Dancer (Manchester), a magazine. Hugh was born in 1922. He discovered Scottish dancing in 1943 while working as one of the genius cryptographers who shortened and possibly won World War II by cracking the Axis's secret codes. He devoted that same intensity to his other sutdies, publishing definitive magazines, books, and articles about Scotland's dances, international folk dancing, ancient astronomy, and mathematical pedagogy. Hugh Thurston took his Ph.D. at Trinity College, Cambridge, Massachusetts. While in the group, The Thistle, they were invited to Italy at the invitation of Italian dancers. They travelled in kilts with their own piper, giving impromptu performances in piazzas. In 1951, while with the Cambridge Reel Club, that group was invited to Sweden. In 1954 he published Scotland's Dances. It was probably the first book to take a careful analytical approach to the history of dancing in Scotland and presents information in meticulous detail, listing the sources of dances currently popular. The book covers the whole gamut of Scottish dancing, from reels, Highland dances, and Hebridean dances to country dances. By 1956, Hugh had moved to Boston, becoming the first editor of the Boston Branch newsletter The Tartan Times. He came to Vancouver in 1958 to take up a position in the Department of Mathematics at the University of British Columbia, and lost no time in founding the West Point Grey Scottish Country Dance Club. In 1961 he first issued his own remarkable dance magazine, The Thistle. The first magazine began with a statement typical of Hugh's understated style: "We have decided to issue a magazine. This is it." The Thistle published new dances and historical studies of traditional dances. It explored similarities and differences between Scottish dancing and other dance traditions. It answered readers' questions on all matters connected with dancing. It gave advice on dance technique. It contained puzzles and quizzes to intrigue its readers (Hugh was ever the playful cryptographer). Above all, the 55 issues of the magazine show Hugh's erudition and the breadth of his interests. He writes with authority not only on Scottish country dancing, but on Serbian, Bulgarian, Scandinavian, Portuguese, and Irish dancing, and on New England contra dancing. Other articles show his detailed knowledge of music. He also was very knowledgable in Swedish dancing. During these years, Hugh and his wife Nina (they married in 1962) taught at SCD workshops in Vancouver, Calgary, and Kamloops. They were also active in the international dance community. In 1964 Hugh served as President of the Northwest Folk Dancers Incorporated, an organization coordinating the folk dancers of Alaska, British Columbia, Washington, and Oregon. Nina edited the group’s newsletter and followed Hugh as President in 1967. A remarkably integrative scholar, Hugh wrote the seminal work on Choreography that initiated and still grounds Ron Houston's study of the subject. A fine dancer and teacher, he formed and taught Scottish and international groups wherever he went (Bristol, Boston, Vancouver). Hugh was one of the few people to disagree with Miss Jean Milligan (co-founder of the Royal Scottish Country Dance Society (RSCDS) and remain her friend. His attitude towards the RSCDS was complex. He combined great personal respect for Miss Milligan with a critical attitude towards the work of the RSCDS in reconstructing old dances. Various Thistle articles pointed out misinterpretations by the RSCDS editors, often showing the reader the difference between the dance as originally written and the dance as arbitrarily re-written by the RSCDS. Yet when Miss Milligan visited Vancouver in 1963, Hugh and Nina were eager to host her. 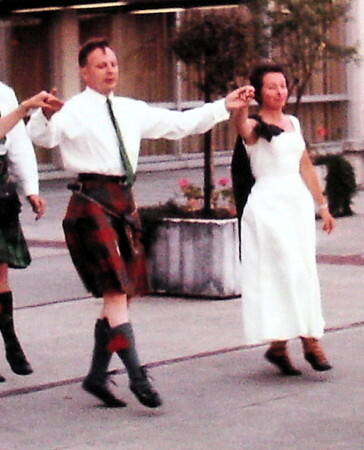 In the early 1970s, Hugh and Nina moved away from Scottish country dancing towards folk dancing in a broader context. A sabbatical year spent in Turkey further spurred their interest in international dancing. After retiring as an Emeritus Professor, his interests turned to the history of astronomy. Hugh died in Surrey, British Columbia, Canada, on October 29, 2006. He and Nina, his wife who preceded him on September 14, left no family. The Calculus, An Introduction. By Hugh Thurston, 1973. Calculus for Students of Engineering and the Exact Sciences, Vol. 1 and Vol. 2. By Hugh Thurston, 1963. Differentiation and Integration. By Hugh Thurston, 1961. Early Astronomy. By Hugh Thurston, Springer Study Edition, 1st ed 1994, 2nd printing 1996. Getting to Know the Cosmos. By Hugh Thurston, 2004. Intermediate Mathematical Analysis By Hugh Thurston, 1989. "Latin Squares." By Hugh Thurston, Eureak 9 (Apr 1947), pp 19-21. "On Balkan Rhythms," by Thurston, Hugh A, in The Folk Dancer (Manchester), 7:6 (Spr. 1963, p.134-5. Scotland's Dances. Thurston, Hugh A. London: Bell, Documentation of Dr. Thurston's research with an excellent bibliography. The Number System. By Hugh Thurston, 1956. "The Babylonian Theory of the Planets." By Hugh Thurston. The Folk Dancer (Manchester). A magazine. Twelve New Scottish Country Dances (1946-1957). Thurston, Hugh A.